Welcome to the second installment of Passanante’s Home Food Service’s “Life Hack Recipe” series which provides easy DIY recipes for some of your favorite meals at popular restaurants. 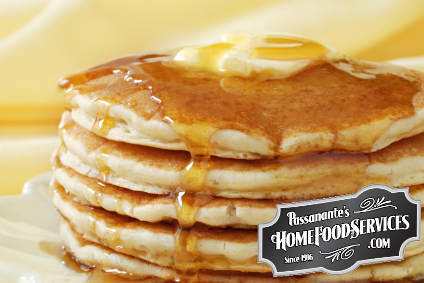 We hope you enjoy these three popular breakfast recipes for IHOP buttermilk pancakes, Denny’s french toast, and Cracker Barrel breakfast casserole. Grab the ingredients, gather the kids and make a memory preparing a delicious breakfast feast and start the day off on the right foot. Melt a small amount of butter in the pan and pour batter by spoonfuls into the hot pan, forming 5-inch circles. When the edges firm up, flip the pancakes. Remove pancakes from heat once both sides are light golden brown. Serve with your choice of butter, powdered sugar, syrup, peanut butter or any other delicious topping and enjoy! In a medium sized bowl, mix eggs, milk, flour, sugar, vanilla, salt and cinnamon to create the batter. Heat a large skillet over medium-high heat and once hot, add 1 tablespoon of butter. Make sure the skillet isn’t so hot that it burns the butter. Dip each slice of thick-cut bread into the batter until saturated. Let the excess batter drip off and place the bread on the skillet. Cook each slice of bread for about 1.5 minutes on each side until both sides are golden brown. You may need to add more butter to the skillet to prepare all 6 slices of toast. Dust each slice of french toast with powdered sugar, and serve with butter and hot syrup. Need a little whipped cream in your life? Check out this guide to making it at home! Coat casserole dish with non-stick spray and place sourdough bread on the bottom of the dish. Add salt, pepper and evaporated milk to the beaten eggs and mix thoroughly. Sprinkle diced ham and shredded cheese over egg mixture and cover with plastic wrap or casserole dish lid. Bake 20 to 22 minutes, depending on how deep the casserole dish is. The casserole is done when the eggs do not wiggle when the dish is shaken lightly. Serve with your other breakfast favorites and enjoy! This entry was posted in Recipes and tagged Breakfast, Cracker Barrel Breakfast Casserole, Denny's French Toast, IHOP Pancakes, Life Hack Recipes by Passanante's Home Food Service. Bookmark the permalink.